A name is everything. 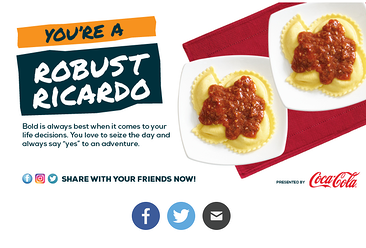 After participants chose their two favorite lunch items, Fazoli expertly analyzed their personality and generated a social media-shareable label. For example, someone who chooses the penne with meat sauce twice is a "Hearty Primo" who "lives by the motto, 'Go Big or Go Home.'" If, instead, he wants the caesar and house salad, he's a "Crisp Salvatore" who's "classic with an extra dash of 'sass.'" These silly descriptions piggyback well on the trend of internet quizzes. Make social visible. Before a visitor picked her top two items, she was asked to like the brand's Facebook page. That way, when she discovered her Pick Two personality, her Facebook account was already linked, allowing her to comment directly on the page and join the scrolling gallery of enthusiastic Fazoli fans. At the same time, she could share her results over Facebook, Twitter, and email with the click of a button. Cast a wide net. In addition to requesting the typical contact information, Fazoli asked participants to select what kinds of offers they were interested in receiving, including family meal deals, low carb / low calorie, and senior specials. This broad approach, coupled with the sleek UX of the site, attracted consumers whose voices aren't always heard on social media, such as Barb, a 65-year-old retiree living in Ames, Iowa who "loves the breadsticks" or Connie, who lives in Chicago and whose "grandkids love for me to take them there!" 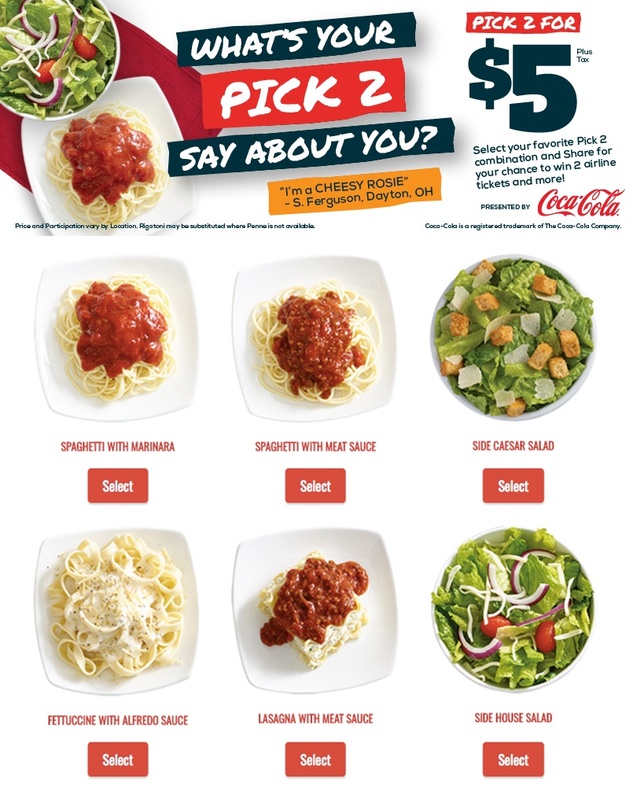 Fazoli's clever names, social media integration, and diverse target audience make the Pick Two campaign a success. The biggest deficiency is that visitors can only select two lunch items — though the brand recently launched a three for $7 campaign for all the Hearty Primos and Crisp Salvatores out there.